The global market for transdermal scopolamine is witnessing a remarkable rise, thanks to rising awareness among consumers regarding it being highly effective in treating motion sickness. The increasing number of travelers across the world is adding substantially to the growth of this market. Transdermal scopolamine also finds application during surgeries as it helps in avoiding hyper salivation and aids in recovery from post-operative and anesthesia-induced nausea and vomiting. As a result of the noticeable rise in the number of surgeries performed globally, the demand for transdermal scopolamine has also increased considerably across the world. Scopolamine is an alkaloid, a secondary metabolite produced by plants of nightshade family such as henbane, Datura, Duboisia, etc. Scopolamine is used to treat motion sickness, and post-operative and anesthesia induced nausea and vomiting. It is often used to treat gastrointestinal spasm, irritable bowel syndrome and eye inflammation. Scopolamine is also used for nausea and vomiting prevention in chemotherapy for cancer treatment. Scopolamine can be administered orally as tablets or syrups, intravenously as injections and solutions, or as transdermal in form of patch or gel. Transdermal scopolamine is a scopolamine patch used to treat motion sickness and post-operative nausea and vomiting. Transdermal scopolamine available today are reservoir patches which can be used for up to 3 days. These patches are applied at back side of ear. These patches are applied 20 minutes to 4 hours before the intended use such as travel, surgery etc. The first transdermal scopolamine patch was approved in 1979, manufactured by Alza Corporation and marketed by Novartis AG by brand name Transderm Scop. There are very few generics approved by FDA for Transderm Scop, which makes the market less competitive. Though there are few small players operating on regional level, however they hold a meager share in global transdermal scopolamine market. The global market for transdermal scopolamine is expected to grow at CAGR of 6.7% over the forecast period from 2016 to 2024. The launch of recently approved generics and projected expansion of international players is expected to drive the growth for this market. Moreover many of the industry players and researchers are investing on development of new transdermal scopolamine products. Transdermal scopolamine is a preferred choice to treat motion sickness owing to its ease in administration, cost effectiveness and availability. Rise in number of travelers across globe is expected to drive the growth for transdermal scopolamine market over the forecast period. Moreover some of the industry players and researchers are investing on development of improved transdermal scopolamine patch on material, adhesion, drug bioavailability and other aspects. Expected introduction of such improved products coupled with launch of new entrants is expected to trigger the growth for transdermal scopolamine market. However there are few concern factors with transdermal scopolamine such as adverse effects, specifically the withdrawal symptoms which are anticipated to restrain growth. 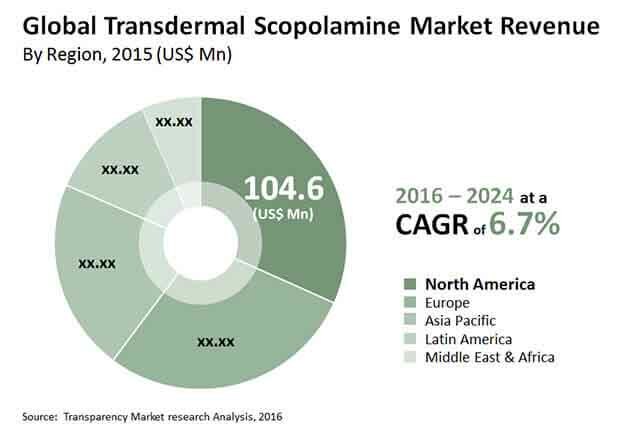 Geographically, the transdermal scopolamine market has been segmented into five regions: North America, Latin America, Europe, Asia Pacific, and Middle East & Africa. These regions have been further segmented to country and sub-regional level. North America is expected to contribute largest share in global transdermal scopolamine market owing to high number of travelers, well established healthcare industry. Europe is expected to hold second position in global transdermal scopolamine market with growing number of surgeries and rising number of travelers. The competition matrix section included in the report is likely to assist the existing players to increase their market shares and new companies to establish their presence in the global transdermal scopolamine market. The report also profiles major players in the market based on various attributes such as company overview, financial overview, SWOT analysis, key business strategies, product portfolio, and recent developments. Key companies profiled in the report include Novartis AG, GlaxoSmithKline plc, Baxter International Inc., Perrigo Company plc, Caleb Pharmaceuticals, Inc., and Myungmoon Pharma Co. Ltd.